“Starry Night” is by Vincent Van Gogh and it was painted in 1889 which is one year before his death in 1890. This was actually the view from his bedroom window while he stayed at an asylum in St. Remy France. When he painted the image of the night sky with stars sparkling in the moonlight, you can count 11 of them. 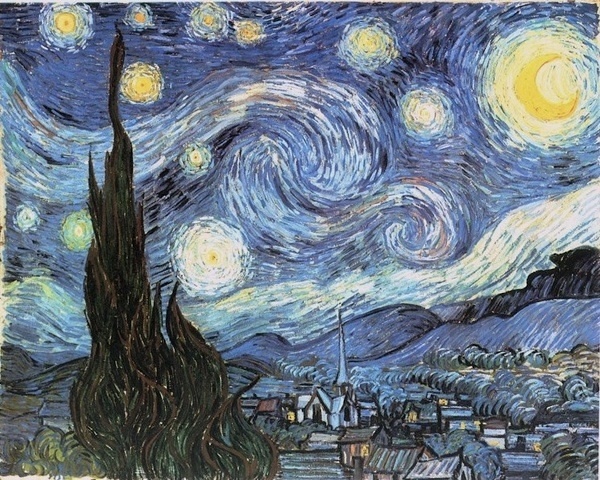 This was influenced by Genesis 37:9 reads, “…Behold, I have dreamed a dream more, and behold, the sun and the moon and the eleven stars made obeisance to me.” It is believed that the Van Gogh Starry Night is derived from this religious inspiration, which could very well be true because of the number of stars in the painting. In a letter to his brother, Theo, van Gogh comments: “I should not be surprised if you liked the Starry Night and the Ploughed Fields, there is a greater quiet about them than in the other canvases. “ Later in the letter he makes reference to Leo Tolstoys book My Religion and its lack of belief in resurrection. Such fleeting mentions of religion echoed van Goghs feelings towards the subject at this time; he could neither forget it nor totally accept it. Despite this, his use of the word ‘quiet’ and reference to Tolstoys book indicates that the night sky made him feel calm and brought to mind eternity. If you look at the dark tree that touches the sky and its massive size in comparison to the village, speaks to me as a representation of Van Gogh himself. The color of black, symbolizes his mental state and the feeling of disconnect from society. the village is painted small, but the window lit with a warm glow. Symbolizing warmth of family, unlike the massive dark tree that stands. Considering this was painted a year before his death, I wonder if he somehow predicted his life was coming to a close. The movement of the stars show power, and it feels as the though he looked out his window every night dreaming among the stars. The distinction of the chapel shows the importance of religion to him.